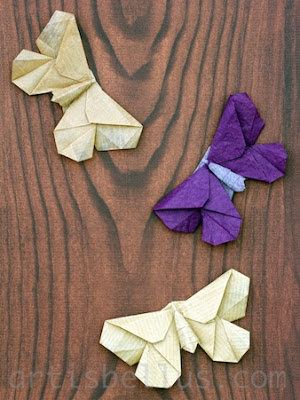 A few days ago someone mentioned in the Origami Mailing List that he found a block of notes with very thin kraft paper sheets. I'm always curious when I hear about new types of paper, so I bought one block of Kikkerland Large Kraft Notes . The paper is ultra thin and strong, very good for folding. I also had a sample of Alios Kraft paper, and some double tissue paper, both very thin too, that I used to fold a few moths. The model is called "The LaFosse Moth". 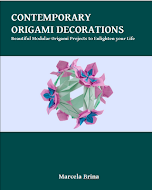 The diagrams can be found in Michaels LaFosse's book, Origami Butterflies Kit . I folded the moths with 6"(150 mm) squares of paper. 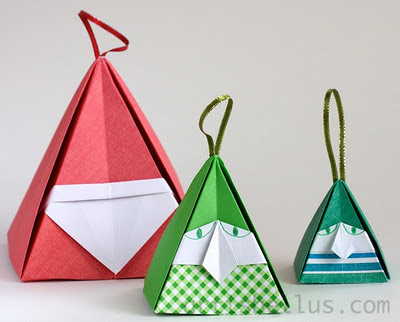 The one at the top was folded with Alios Kraft paper, the one at the middle with double tissue paper, and the one at the bottom with Kikkerland Large Kraft Notes paper. Hi Chris. Thanks for sharing your discovery on the list. I only had the sample of the Alios Kraft that I used to fold the moth, so my experience is limited. They fold very similar, although I think Alios Kraft it's a little bit crispier than Kikkerland. On the other hand I liked more the appearance of Kikkerland paper (Alios Kraft is shiny on one side).